Integrating a dominant body of Ehlenberger's art work is his interpretation of a fantasy world of Venus. A lifelong work-in-progress, his Venusian sculptures include multiple series of art works that explore the landscapes as well as the flora and fauna of his imaginary world. Furthering the evolution of his Venusian work, Ehlenberger also explores the unusual art form of the diorama in which he combines sculptures of different series to create life-size scenes of his luminous "Venusian World" including a variety of "Venusian Gardens." 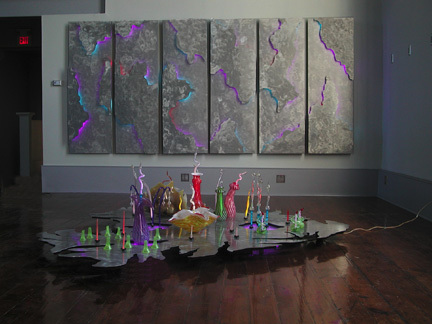 The culmination of this work is "The Venusian Gardens, A Fine Art Gallery of Luminous Art and Sculpture," his new studio and gallery in the recently renovated 150 year-old historic church in New Orleans. The focus of this new gallery is a large scale Venusian Garden diorama including more than a dozen Jellyfish suspended over a variety of Venusian Swamp Gardens, Rock Gardens and other various flora of the Venusian World. Photographs of the installation are coming very soon. Central to the concept behind Ehlenberger's Venusian World, including the Venusian Gardens and dioramas, is the system of interchangeable components of the work. Ehlenberger's Venusian sculptures consist of separate components that are interchangeable and therefore allow for flexibility in design. The neon tubes are wireless and are mounted in pyrex glass housings that enable each neon tube to be easily replaced or exchanged within any Venusian sculpture or garden. In addition, the glass components of the flowers are also interchangeable. Finally, the bases that support the sculptures and gardens are designed to allow for different components and/or configuration of components so that each garden or component of a garden can be easily changed without the need for tools or wiring. As such, one may "pick a Venusian flower" in a garden and place it in a new and different base thus allowing for personal customization of the sculpture.